Even before the war, German opponents of Hitler had considered overthrowing the Nazi regime; the first unrealized plan to overthrow Hitler was during the Sudeten crisis in 1938. A successful coup, however, depended upon the support of key German military figures; their readiness to take such risks diminished with the German victories in Poland and on the western front. This was maddening to civilian conspirators like Dohnanyi, who distrusted the military leaders and condemned their reluctance to move decisively against Hitler. German resistance groups hoped to convince their Allied contacts of their seriousness and win foreign support for the overthrow of the Nazi regime. In October 1940, Dietrich Bonhoeffer began work as an agent for Military Intelligence, supposedly using his ecumenical contacts to help the cause of the Reich. In reality, he used his contacts to spread information about the resistance movement. In trips to Italy, Switzerland, and Scandinavia in 1941 and 1942, he informed them of resistance activities and tried, in turn, to gain foreign support for the German resistance. Dohnanyi and others put great hopes in Bonhoeffer’s foreign contacts, particularly in Bishop George Bell’s ability to carry messages to the high levels of British government. In turn, Bonhoeffer tried to convince his foreign contacts that some Allied signal of support for the German conspiracy was crucial, since only this would convince the German military to move against Hitler. The Allied governments greeted these peace feelers with distrust. The military members of the resistance wanted guarantees of German territorial integrity and of their own position as leaders of a postwar Germany. Allied diplomats and leaders found this demand unacceptable, and never seriously considered support for a German coup. In January 1943, Churchill and Roosevelt announced that only the unconditional military defeat of Germany would eradicate Nazism. Despite these rebuffs, the conspirators continued to plan Hitler’s downfall. But, as prospects for an early coup dimmed, some also searched for ways to help the victims of Nazism. On September 5, 1941, all Jews in the Reich were ordered to wear the yellow star; the first deportations to the East from Berlin occurred on October 15. On October 17 or 18, Bonhoeffer and Friedrich Perels, a Confessing Church lawyer, wrote a memo giving details of these first deportations. 17 The memo was sent to trusted German military officials in the hope that it might move them to action, as well as to ecumenical contacts and the US State Department. In Dohnanyi’s office, a plan was conceived to get Jews out of Germany by giving them papers as foreign agents. The plan was not that far-fetched: in several cases, Nazi intelligence offices had used Jewish agents as a cover. There was also a steady underground business that helped Jews emigrate in exchange for large sums of money. The Dohnanyi/Canaris effort, termed “Operation Seven,” eventually spirited fourteen Jews out to Switzerland (eleven had converted to Christianity; three had not). 18 Bonhoeffer used his ecumenical contacts to arrange visas and sponsors for the group. 19 At his instigation, one of those rescued was Charlotte Friedenthal, who had worked with Marga Meusel and with the Grüber office. Friedenthal reached Switzerland in August 1942; the others arrived in September. Dohnanyi’s office immediately began plans for a new rescue attempt; before anything could come of these, the Gestapo traced the vast amounts of money that the conspirators had sent abroad for the emigrants. The arrests of Dohnanyi and Bonhoeffer followed in April 1943. Initially, the Gestapo treated it as a corruption case, accusing Dohnanyi and his colleagues of lining their own pockets. They soon realized, however, that the rescue attempt was the tip of a larger iceberg. Bonhoeffer was charged with conspiring to rescue Jews; of using his travels abroad for non-intelligence matters; and of misusing his intelligence position to keep Confessing Church pastors out of the military and for his own ecumenical work. The Gestapo report on Bonhoeffer described him as “completely in the opposition.” 20 Still, even after the failure of the July 20, 1944, attempt to kill Hitler, it was months before the Nazis realized the extent of Bonhoeffer’s involvement in resistance circles. In October 1944, Bonhoeffer was moved to the dreaded Gestapo prison in Berlin; in February 1945, he was taken to Buchenwald. 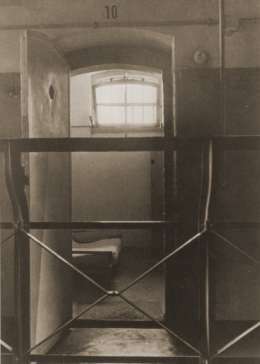 He was then moved to the Flossenbürg concentration camp where, on April 9, he was hanged, together with Canaris, Oster, and other conspirators. Hans von Dohnanyi and Klaus Bonhoeffer were executed days later. 17 Bonhoeffer, Gesammelte Schriften, Vol. II, 640–643. 18 Winfried Meyer, Unternehmen Sieben: Eine Rettungsaktion. Frankfurt a. Main: Verlag Anton Hain, 1993, page 24. Meyer’s book is the most detailed account of Operation Seven and Bonhoeffer’s involvement in it. 19 Ibid., pp. 120-121, 306–335. 20 Jacobsen, H. A. Spiegelbild einer Verschwörung. Die Opposition gegen Hitler und der Staatsstreich vom 20. Juli 1944 in der SD-Berichterstattung. Vol. I. (Stuttgart: Degerloch), 508. 21 Bethge, Op. Cit., 1037–1038.